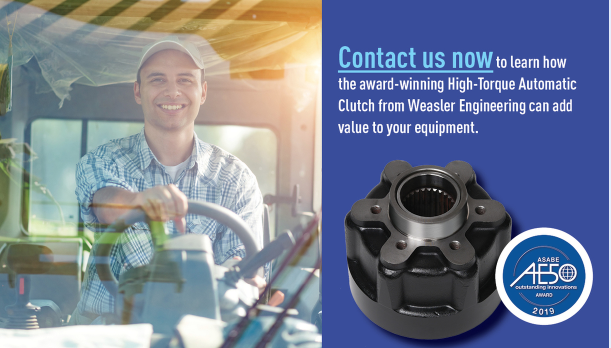 ASABE Says Our High-Torque Automatic Clutch Is a Real Winner - Weasler Engineering, Inc.Weasler Engineering, Inc. 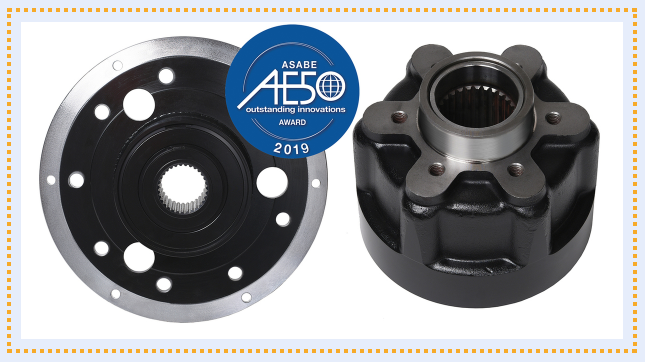 The American Society of Agricultural and Biological Engineers (ASABE) has named Weasler Engineering’s High-Torque Automatic Clutch the winner of a 2019 AE50 award. AE50 awards honor the year’s most innovative designs in engineering products or systems for the food and agriculture industries. For agricultural OEMs, Weasler’s new clutch offers optimal design flexibility. “Our through shaft design enables a range of mounting options, from flywheels and sprockets to flanges or hubs,” Johnson added. Repeatable high-torque overload prevention protects equipment, minimizing downtime and maximizing harvest rates. Rpm sensor compatibility allows for easy integration of computer monitoring system. Design: Adaptive design allows mounting flexibility to meet a wide array of your needs, including flange bolt patterns, flywheels, sprockets, and hubs. Driver bores are available up to 65 mm. Through-shaft design increases mounting flexibility and applications. Wear resistant materials ensure repeatable protection and durability. Sealed design requires zero maintenance for the life of the clutch. Click to download a brochure on our new award-winning clutch! ASABE is an international scientific and educational organization dedicated to the advancement of engineering applicable to agricultural, food, and biological systems. The AE50 awards program emphasizes the role of new products and systems in bringing advanced technology to the marketplace. These engineering developments help farmers, food processors and equipment manufacturers increase efficiency, enhance quality, improve safety, and increase profits. Companies from around the world submit entries to the annual AE50 competition and up to 50 of the best products are chosen by a panel of international engineering experts. Weasler Engineering is a global leader in the manufacture and distribution of mechanical power transmission solutions for all varieties of agricultural machinery. Farming, lawn and turf, construction, industrial, and marine OEMs worldwide look to us for innovative and dependable drive train systems and components. Founded in 1951, the Weasler brand is widely recognized for unsurpassed quality, on-time delivery, consistent reliability and exceptional service. Weasler is wholly owned by Actuant Corporation, a diversified industrial company serving customers from operations in more than 30 countries.